Giants cornerback Eli Apple told reporters at OTAs that he has lost fat and gained muscle, as he’s now up to 204 pounds – five pounds heavier than last year at the combine. The 2016 first-round pick was asked to play a lot as a rookie (772 snaps including playoffs). Dominique Rodgers-Cromartie manned the slot with Apple splitting time at both outside CB positions. He played 46.4 percent of his snaps on the right side and 37.6 percent on the left. 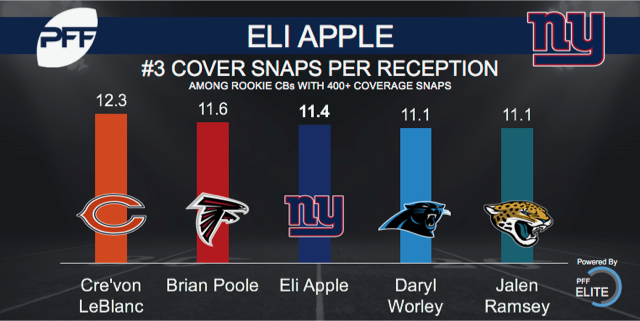 Apple will look to improve on a promising rookie year, after he allowed 1.19 yards per cover snap and a 97.2 passer rating into his coverage. Though Apple was not the most efficient tackler (nine missed tackles), he only allowed 138 yards after the catch. That number was good enough to rank 14th out of 79 qualifying cornerbacks. Quarterbacks did not go after the rookie often and when they did he usually didn’t allow a catch. Apple only gave up 38 total receptions over 434 coverage snaps, never allowing more than five receptions in a single game.